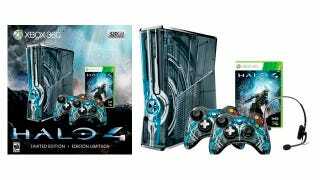 A Microsoft store listing, since removed, said a limited edition Halo 4 console bundle will be released, delivering the game and a specially designed case on a 320 GB Xbox 360 configuration for $400. IGN spotted the listing earlier this evening. The Halo 4 360 will play custom Halo sounds whenever the device's capacitive eject or power buttons are pressed brushed lightly grazed. The bundle also includes two custom-skinned controllers, a headset, and codes to redeem Halo 4 downloadable content. Naturally, as soon as the listing popped up, Microsoft removed it. Halo 4 is due on shelves on Nov. 4.